(March 2016) After far too little sleep again, we checked out of our hotel in Tbilisi and boarded two vans to climb over the mountain to the Kakheti Valley – about a two hour drive from Tbilisi. The further we climbed in the mountains, the twistier the road became. Soon snow drifts appeared on the side of the road, and when we reached the top of Gombori Pass, we were surrounded by snow, so we stopped to take some photos and have a snowball fight. As we descended towards the Kakheti Valley, where 70% of the vineyards are located, we saw our first glimpse of the magnificent snow-capped Caucasus Mountains rise in the distance. They towered over the valley below, like a big white comforting wall, separating Georgia from Russia on the other side and protecting the vines from cold winds. I had no idea how huge they were, or how impressive they would appear at over 15,000 feet tall. We learned later that we were fortunate to see them so clearly, because they are often obscured in the clouds. Ikalto Winey Academy – Oldest Winemaking School in the World? Our first stop was the Ikalto Winey Academy, which began in the 6th century (see other post). 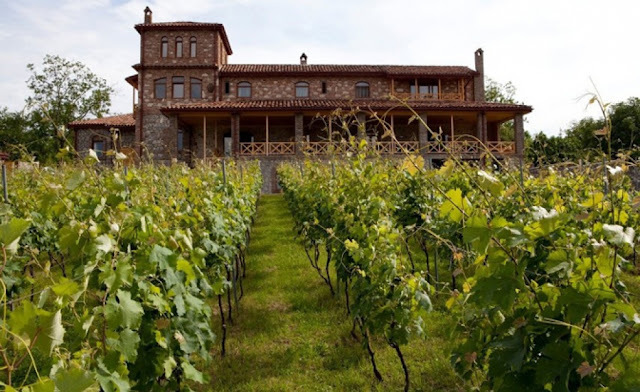 It is located in the foothills just before you descend into the long Kakheti Valley, filled primarily with vineyard, wineries, and several small towns. The main one is Telavi. Alaverdi Monastery is outside the town of Telavi and surrounded by vineyards. The director is Bishop David, and he is assisted in the operations of the massive estate by a group of five monks. They manage the vineyards, orchard, church, visitor center, and make and sell wine. The church was actually started in the 6th century, but was destroyed over the years in a series of wars. Most of the buildings now were built in the 11th century, and their motto is "since 1011." It is a beautiful collection of old stone buildings, including an ancient winery complete with qvevri cellar as well as some modern stainless steel tanks. Bishop David and the monks welcomed us as we walked through the massive gate into the walled compound of the monastery. It was a warm sunny day, and the pink and white blossoms on the fruit trees were just coming into bloom. There were small patches of vineyards dotting the expansive grounds, and the Bishop told us they had 104 different grape varieties planted. First we were given a tour of the ancient church that had withstood so many attacks over the years. It is slowly being renovated. 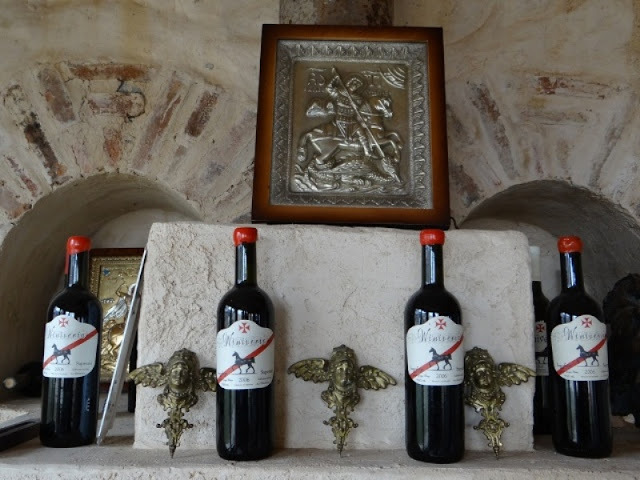 2013 Alaverdi Monastery Cellar Rkatsiteli Republic of Georgia - golden orange, dried apricot on nose, spice, nutty. Even more textured. Very dry, higher alcohol than 2014. Can use with any food. 2013 Alaverdi Monastery Cellar Saperavi Republic of Georgia - opaque black. Mixed berries on nose, black liquorice and herbs, which carried through to palate. Very concentrated, tannic and tight. Needs more time. After the tasting, we were allowed to purchase wine and other products made by the monastery, such as honey, souvenirs, and hats made by local women that several of us bought. It was a brilliant tasting and afternoon. In my opinion, if you could only visit one winery in Georgia, this would be it! NOTE: When I returned home, I was delighted to find I could buy their Rkatsiteli at K&L in San Francisco for $25. I also learned that the 2010 was listed as one of the Top 100 Wines of 2013 in Wine Enthusiast, receiving 92 points. We finally made it to lunch at 4pm today, and when we arrived at Schuchmann Winery, we fell upon the long table spread out with delicious Georgian food like a pack of wolves. Fortunately the owner, Burkhard Schuchmann, was understanding and he welcomed us with gracious hospitality, allowing us to eat before he explained his story. And his story was truly inspiring. He explained how he had visited the Kakheti Valley in 2006 and instantly fell in love with the country, the people, and the wine. Therefore he decided to invest in the industry, buy an old winery, remodel it, and today it is an incredible place to visit, including a delicious restaurant, a tasteful hotel, and a spa on the way. The view of the Caucasus Mountains from this winery is also stunning, and I would enjoy staying here on a return trip. Burkhard stated that the winery now produces around 1.5 million bottles and exports to 20 countries, with Russia, Kazakhstan, China and the Ukraine as the largest markets. He explained that this is because traditionally they have always purchased Georgian wines. I was surprised, to learn however, that they are also exporting wine to the US because it has a population of 5 to 6 million ethnic Georgians. After speaking, Burkhard introduced us to his CEO, Nutsa Abramishvili, who was a brilliant speaker and described how well the winery is doing in terms of wine tourism. She also described the expansion with the new hotel and spa. I was very impressed to find a Georgian winery with a female CEO. After an excellent lunch, we were invited to tour the winery with winemaker, George Dakishvili. He explained showed us their qvevri cellar and explained their winemaking practices, then escorted us into a tasting room for masterclass on qvevri wines from around the country. It was a stunning tasting, made more so by the sun setting over the Caucasus Mountains in such streaming glory that we all jumped up from the table and ran outside to take photos. We finally arrived at our hotel and checked in around 7pm. Hotel Mere is an unusual (some in our group described it as bizarre) castle creation filled with antiques and funky art. It has a whimsical charm that I fell in love with. The first room I was assigned to in the new wing didn’t have curtains that closed, so I asked for another room and they said all they had left was a room on the very top floor of the castle. With thoughts of Cinderella and her attic in my mind, I followed a nice young man who was carrying my suitcases, up three winding flights of stairs (there is no elevator). After jiggling the old iron skeleton key around in the lock for several minutes - making me wonder how I would ever open and close the door myself - he ushered me into a three room suite with a balcony running around three sides. I immediately ran to the windows (which had nice long curtains), and pushed opened the door to step onto the balcony and the night sky. I knew the massive wall of the Caucasus Mountains were breathing out there in the dark night air, and I couldn’t wait until the morning when I could open the curtains and see them. After hurriedly unpacking, I went back downstairs for our 8pm happy hour and dinner. Everyone was having gin and tonics at the bar, so I joined them – a refreshing drink after a long day of wine tasting. Dinner was a jovial affair with many amazing Georgian dishes – as usual! – and more wines to taste. The tasting was hosted by Winiveria Winery, which makes a collection of tasting wines featuring an attractive horse label. It was a truly delightful evening!